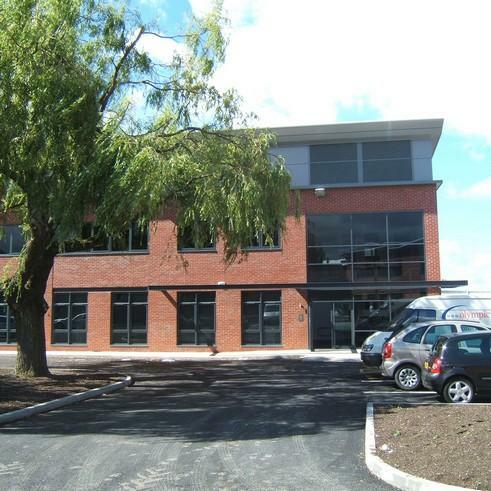 A new build commercial development that was built out following the acquisition and reorganisation of a site owned by a Japanese fork lift truck manufacturer in Denton. Following the re housing of the site’s previous owners and the demolition of their existing stand alone HQ offices, the resultant 2 acre site is home to over 30,000 sq ft of office accommodation with associated car parking. Although lower than a usual target density, the site is triangular in shape had an easement over HV electrical supplies. The scheme comprises 3 buildings that offer individual, front door, two storey, and office accommodation. Each responds to a client brief that office areas can be split horizontally on a floor by floor basis in addition to one being split vertically within a terrace. This results in the 3 buildings having the flexibility to be subdivided into 10 self contained offices with shared common areas, all at a gross to net efficiency well over the ‘standard’ 85% due to the optimum placement of shared cores and means of escape. Client: Property Alliance Group Ltd.